What will it take to ensure that all children have an opportunity to learn and to thrive, regardless of their background or which school they attend? The opportunity gaps faced by children arise in their schools and in larger structural inequalities like housing, poverty, parental unemployment, and disinvestment of public resources. There are two possible solutions. We can counteract the weight — that is, intervening in a serious and sustained way at the school level to increase resources and supports. Past efforts to do this have been shockingly inadequate. The other option is to cut those weights off entirely, through a serious and sustained effort to address the larger inequalities. Neither option is easy, but any just future for our children and communities demands that we act. Horace Mann famously positioned public education as the “balance wheel” of society: able to raise all people up regardless of their background and give them an equal opportunity to succeed. The school-centric reforms start to flesh out what exactly we would need to do to see Mann’s vision come true. The systemic reforms offer solutions that cut closer to the true root of the problems so many children face, dispensing with the need for such a balance wheel. 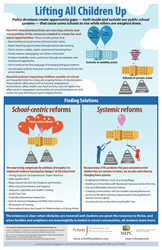 The reforms listed in this infographic are drawn from policy recommendations in an NEPC brief authored by Jennifer King Rice, along with the book Closing the Opportunity Gap by Prudence Carter and Kevin Welner. The NEPC policy memo, Lifting All Children Up, can be found on the NEPC website at http://nepc.colorado.edu/publication/lifting-all-children.